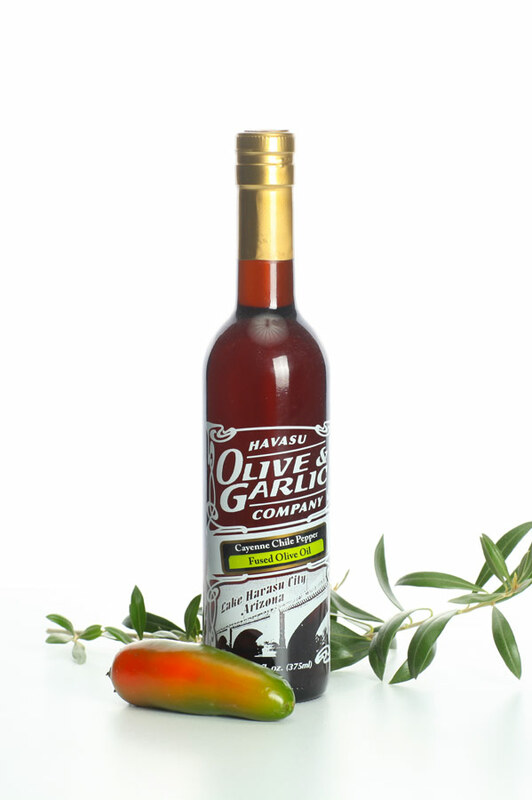 Product code: Cayenne Chille Pepper Fused Olive Oil Category: Fused Olive Oil. Oh My! After all, this is Arizona my friends. Hotter than a mid-August day in Havasu. Our Red Cayenne Fused Olive Oil is created exclusively in our organic mill in Tunisia. The process involves the crushing of over 12 pounds of chilies for every gallon of our best organic EVOO. The process involves two laborious hours of fusion before decanting and filtration. The result is a red oil with a heat and flavor profile that are perfect for the bold of us on Seafood, Steaks, Roasts, Lamb Game, Chicken and more. I paired it recently with our Maple Balsamic Vinegar and was extremely impressed. LIMITED SUPPLY! This extremely popular and sophisticated Oil packs a flavor punch that will perk up any meal. We love it on Oven Roasted Potatoes, Chicken, Lamb, Root Vegetables and enhancing Hearty Vegetable Soups. What it does brushed on a baguette is wonderful. Crushed Fresh Wild Mountain Rosemary fused with Green Olives to perfection. Pair with our Sicilian Lemon White Balsamic Vinegar for a nicely balanced dressing.